The OPL-8B optical fiber pulse link system is a transmitter/receiver pair designed to send eight multiplexed channels of metering pulses over long distances. The OPL-8B can receive and transmit pulses over distances up to 68 miles. Transmission distances vary depending on the quality of the fiber. The OPL-8B system makes it possible to quickly implement an 8-channel optical pulse link with minimal effort. The system includes the power supplies, wetting voltage, isolation relays, and terminal block connectors making it possible to have a multichannel optical link up and running in minutes. The OPL-8B utilizes standard “ST” twist lock connectors and makes connections reliable, quick and easy. The fiber optic cable is not included. 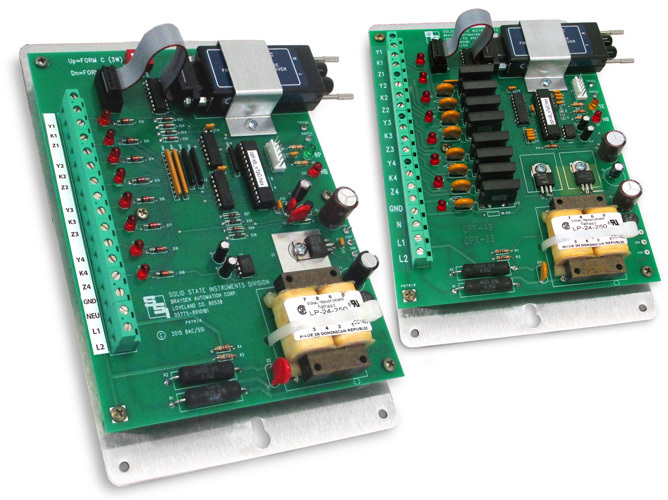 Each OPL system is made up of an OPT-8B transmitter and an OPR-8B receiver. 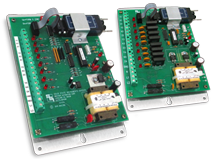 The OPT-8B transmitter is designed to receive pulses from electric meters’ KYZ pulse initiators. Pulses are conditioned, multiplexed, and sent by fiber to an OPR-8B receiver where the pulse information is validated, de-multiplexed, and implemented into the correct pulse state. Each input is configured as Form A (2-wire). The OPT-8B transmitter requires an OPR-8B receiver of the same fiber type. Bright red and green LEDs monitor the input status to the OPT-8B transmitter and provide easy & immediate visual system checking without additional test equipment. An incorrect sequence of input pulses will not be recognized and only the first valid pulse of the sequence will be transmitted. While the OPT-8B transmitter is primarily designed for the transmission of metering pulses, it is capable of transmitting any desired Form A contact closures such as a relay, switch, breaker status, etc. to an OPR-8B receiver. The OPR-8B receiver also includes bright red and green LEDs to monitor the KYZ output status. The OPR-8B features eight solid-state Form A dry-contact output relays (SPST) for a no-bounce contact with internal transient suppression circuitry to eliminate electrical noise and harmful voltage transients. OPT-8B-1 Transmitter, OPR-8B-1 Receiver, ordered separately, multi-mode fiber, 0-2.5 miles. OPT-8B-2 Transmitter, OPR-8B-2 Receiver, ordered separately, multi-mode fiber, 1-9 miles. OPT-8B-3 Transmitter, OPR-8B-3 Receiver, ordered separately, single-mode fiber, 0-14 miles. OPT-8B-4 Transmitter, OPR-8B-4 Receiver, ordered separately, single-mode fiber, 10-50 miles. OPT-8B-5 Transmitter, OPR-8B-5 Receiver, ordered separately, single-mode fiber, 10-68 miles.